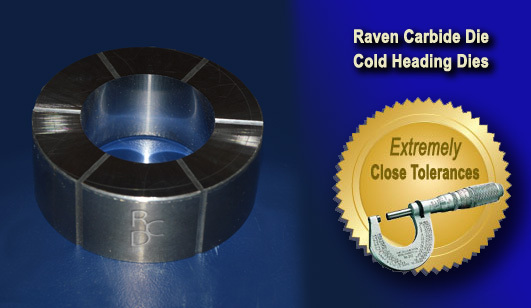 Raven Carbide Die specializes in producing long lasting, high quality, carbide cold heading dies for the heading industry. We understand the extreme pressure cold heading and cold forming dies are put under, so we have applied our expertise to make sure your dies last longer. Using Raven Carbide’s LongLife™ dies saves you time and money. With our cold heading dies you save money by not having to buy as many dies, by having less down time (more parts produced) and by saving on labor due to less frequent replacements. RCD achieves these results by using a variety of methods including high polish finishes and more effective grades of tungsten carbide. RCD also provides cold heading dies at an average of 15-25% lower than our competitors, which means even more money in your pockets. Using Raven Carbide’s LongLife™ also means that you can cut down on, or eliminate, rejected cold forming dies and tooling. 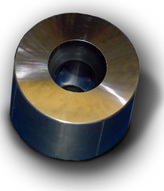 At Raven Carbide Die, our goal is to provide you with the ability to beat your customer’s expectations, by providing your operations the ability to create superior products at a lower cost. Contact our sales team to discuss your requirements and get the RCD Competitive Edge! What is Cold Forming Anyhow? Modern cold forming is a technique used for rapidly forming metal parts such as screws, bolts and many other fasteners. Cold forming, also referred to as cold heading, uses a heavy strike against a cold metal slug to shape it into its desired form. The force of the strike exceeds the metal’s yield strength, causing the metal to flow into the desired shape inside the carbide die. Precision Parts and Superior Designs - Better made dies last for thousands of more parts - Saving on downtime, labor and carbide die costs since fewer dies will do more! Unbeatable Customer Service - We make your job easier for you. If you need a rush job or some pointers on getting more out of your dies, that's no problem. Rest assured we are committed to your success!